We would like to invite you to the stand of Djadadji on this year`s exhibition 'Energy Efficiency and Renewables', 27-29 March 2018 in the InterExpo Center in Sofia-Bulgaria. With our stand, Djadadji will represent Dutch producer of industrial biomass boilers Kara Energy Systems. 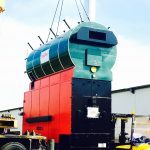 With Kara, active for 50 years in producing biomass boilers, we are launching its first boiler (2,4 Megawatt steam) in Bulgaria running on .... straw! Essential here is that our agribusiness customer closes their production cycle using residual straw to produce heat that is needed back in production. As with wood, there is a large abundance of underutilized agri-residues resources available, for which Kara, as one of the few in the world, has the technology to deal with that particular type of fuel. We gladly meet you at our stand on 27, 28 or 29 March to discuss your investment ideas. If you are unable to attend, we can always arrange another type of meeting, either in your place or ours (6 Bigla street, Lozenec-Sofia). For further details, look at our website www.djadadji.com. Djadadji has been admitted to the list of organizations of the Bulgarian Climate Coalition (http://climatebg.org/about/members/). This organization has been set up at the initiative of the Bulgarian chapter of the World Wildlife Fund. Next to several NGOs, there are a number of Bulgarian companies who have been admitted to the list of members, and who have demonstrated to contribute not only to strengthening networks of climate related organizations, but who have also shown to be able to deliver meaningful, on the ground solutions combating climate change, either in preventing further change to the climate (mitigation) or deal with the adverse effects of climate change (adaptation). Joining the Climate coalition is in line with the main objective of Djadadji in order to contribute in reducing and preventing climate change by promoting clean energy solutions. Djadadji is providing since more than 10 years consultancy, sales and project development services and has contributed to a number of projects demonstration the use of clean energy both in Bulgaria and the wider Balkan region. Djadadji welcomes and is open to cooperation on various projects related to the use of clean energy (renewable energy, energy efficiency). Electric power plants with installed capacity of up to 5 MW with cogeneration from woody biomass - 348,28 BGN /MWh. For detailed information please do not hesitate to contact us!